Did you visit Peak and Aesthete to rediscover the joys of dining together? It’s an intricate dance around here most days. There are any number of errands and household cores to be completed before the day is done. Throw in the marauding toddlers and dog and the day gets exponentially more complicated. 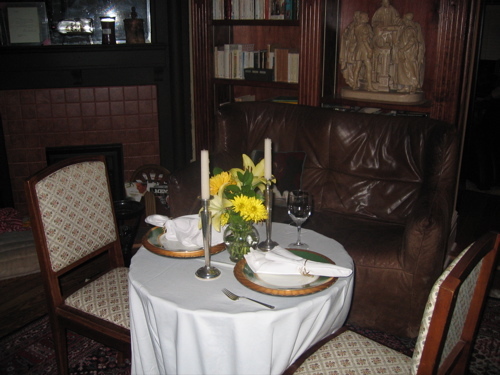 A quiet dinner for two? Not exactly on the menu most evenings… . That’s why I was grateful to be reminded of the simple pleasures of dining alone with Mrs. E., undistracted by so much as a classic movie. Above you see my quickly cobbled together take on the magnificent spreads which Peak was kind enough to share with us and the easy dinner inspired by Aesthete’s reminder that something new always makes for a special meal. I didn’t have time to do a proper dessert, so that course was cheese and champagne. With the salad before and the easiest “pie” that you can imagine, we had plenty of time for candlelit conversation. Highly recommended as an easy and elegant break from the ordinary. The Easy and Elegant Life Zucchini Pie. 1/2 sweet onion grated or minced. Marinate chopped tomatoes, parsley in a basalmic vinaigrette. Melt butter and coat the inside of a skillet. Sauté the zucchini, onion and garlic for 5 minutes or so. Splash with the lemon juice, salt and pepper to taste. Add in the cheese(s) and continue to cook until the cheese begins to melt. Pour in the egg/milk mixture and stir to coat the vegetables. At this point you have a fancy omelette. If using Panko breadcrumbs, prepare a casserole dish by coating the inside with butter and the breadcrumbs, preheat oven to 350ºF. Cook the vegetables and add them to all other ingredients in the casserole and cook until the top is browned. 15-20 minutes? Let the result cool. Cut into wedges and top with the marinated tomatoes. We served this with a Sauvignon Blanc. Sorry for the hastily shot photos…. bon appétit! This entry was posted in Living and tagged dinner for two, recipes. Bookmark the permalink. 6 Responses to Pas de Deux? 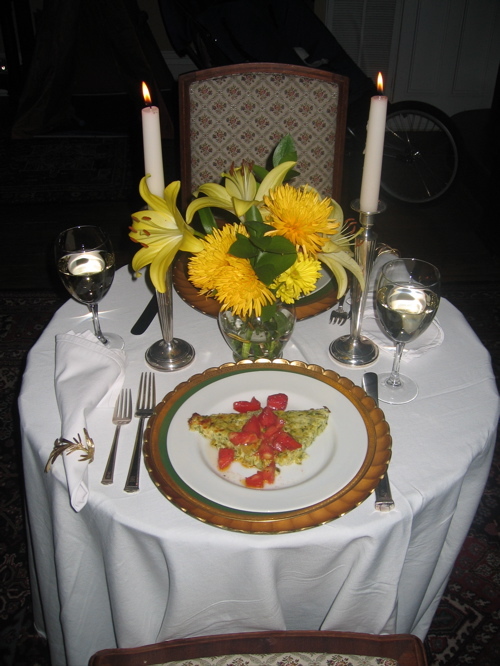 Sometimes “quickly cobbled” ideas are the very best as is shown by the easy, elegant, and simple table you set. The thought was all there. Lucky Mrs. E! Well, the hastily shot photos are just the sort of thing to get me into gear for a table for two! What a lovely table, fine meal, lovely drink and all w/o the check. What a way to end a day, easy and elegant, but of course I would expect no less. What a lovely table! Thank you for the recipe for zucchini. It is in season here and we have received quite a bit from our relatives. I am thrilled to have something new (and delicious!) to do with it. I love it!!!! Your table is quite elegant, and the zucchini recipe sounds divine. You have inspired me to do the same! Lovely! I’ve been eating lots of home-made gazpacho these last weeks. Perfect warm-weather supper! Thanks everyone. It occurs to me that gruyère would work really well in the recipe, too. In fact, I may have made it that way… it’s either photos or written recipes, never the twain shall meet. Lamb tagine, inspired by the visit to the Afghan Gold exhibit, tonight!